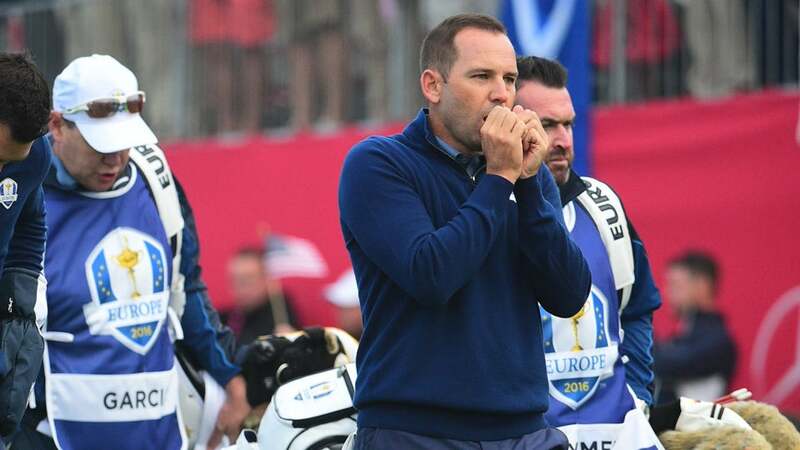 Sergio Garcia let his displeasure be known following his opening round 76, calling the course's thick rough "dangerous" and blaming the tall grass for a shoulder injury he sustained in Wednesday's pro-am and reaggravated on Thursday. PALM BEACH GARDENS, Fla. (AP) -- Sergio Garcia made an eagle, avoided an alligator and wound up in a share of the lead Thursday in the Honda Classic. Garcia holed out with an 8-iron from 142 yards into the wind on the second hole for an eagle, and he narrowly missed an eagle putt on the 18th hole at PGA National. The Spaniard shot 5-under 65 and shared the lead with Michael Thompson, the 2013 Honda Classic winner, who also birdied the last hole. They were one shot ahead of Rickie Fowler and William McGirt. The biggest excitement for Garcia was on the par-4 sixth hole, where he made his lone bogey. His tee shot found the water left of the fairway, shallow enough for him to roll up his pants and try to play it out to the fairway. That part was easy. He looked over his shoulder because of an alligator on the island, making sure it wasn't going anywhere soon. "I was more worried about the alligator that was on the other side of the island than getting out of the water," Garcia said. "The ball, I could see probably half of it, so I knew that I could get it out. Almost made 4, which would have been a great 4. I'm not going to lie, I was happy with a 5." And he was happy with other 60 strokes he took on a typical windy day at PGA National. Garcia missed the cut last week at Riviera, two days in which he said he did nothing well. Hardly anything went wrong for him in the Honda Classic, and even when it did, he managed to avoid trouble. Garcia had to play a 40-yard hook from the rough left of the 10th fairway to just short of the green for a simple par. Fowler had the only bogey-free round, which included a chip-in for par on the 10th hole. McGirt was more on the wild side by making seven birdies. "Anything in the red is good around this place," McGirt said. "At 4 under, I would say it was bordering on great. This place is never easy, even when it's calm. You can't fall asleep on any shot out here." For the early starters, it was a rude welcome to the Florida swing - chilly and gusts that approached 30 mph. Phil Mickelson extended his good play from a runner-up finish at Pebble Beach and shot 69, among 10 players who managed to break par in the morning. The wind eased slightly and the warmth returned briefly in the afternoon, and the crowd had a lot more to cheer. That included the loudest cheer of the day on the par-3 17th, where Alex Cejka made a hole-in-one. Rory McIlroy, however, wasn't in a happy place when he finished. Standing outside the scoring area, he smacked his putter on the concrete before going inside to sign for a 72. It wasn't an awful score, but the finish led to his angst. He hit the face of a bunker on the 14th hole and went into another fairway bunker, put his third in more sand left of the green and made double bogey. After a birdie on the 15th, McIlroy came up short into the bunker on the 16th for a bogey, and he finished his round with a three-putt bogey from 10 feet. Fowler was playing for the first time since he lost a two-shot lead with two holes to play and Hideki Matsuyama beat him in a playoff at Phoenix Open. Fowler said he spent a week with friends and played plenty last week to get ready for a big stretch. He opened with two birdies in three holes and was in position most of the day. "I think we got a good break playing in the afternoon today," he said. "I think the wind laid down a little bit for us. I know the guys had a tough time this morning and the course was not easy. Still didn't play easy out there for us. I felt like I swung it really well tee-to-green. Would have been nice to putt a little better, but still a nice, solid round to start off the week." Garcia is playing for only the third time this year. He tied for seventh in Qatar and was never close to making the cut at Riviera. "I didn't come in with a lot of confidence," Garcia said. "For sure, you are wondering a little bit, because usually my long game, it's up there, and even when I'm not playing great, I still can manage to get around it. But last week, I felt out of sorts. I didn't know what was going on." He took four days off, played 10 holes Wednesday in the pro-am before the rain arrived and it all felt good again. "It's only the first round," Garcia said. "We still have three tough rounds to go on a very difficult golf course. But any good round, it's always welcome."